I know I haven’t really said much about my cycle. I guess I haven’t really been ready. But as I am feeling more healed and nearing a place where I do want to try again, I think it’d be good for me to write about my cycle. I think I got off pretty easy doing a short antagonist protocol. It wasn’t easy, but it wasn’t near the horror stories had read about either. Begin 81mg baby asprin, prenatal vitamin and 4mg folic acid daily. 05/27-6/9 (began day 3 of cycle) Birth Control Pill to “quiet the ovaries”. Baseline Ultrasound 06/08: one small cyst. Blood test to see if it is functional or hormone driven. Call at 3pm tells me it is functional and we are a go. Beginning 6/13: 300 IU Bravelle every night at 6pm. 06/17: uterine lining is 3 stripe, 9mm. Perfect…Afternoon call informs me that I am to cut Bravelle to 150IU and begin Menopur and ganirelix. 06/22:Egg retrieval, 18 retrieved, 17 fertilized by ICSI, 8 made it to blast on day 5. Begin Prometrium 200mg capsules twice a day, and Endometrin suppositories twice a day. 6/27- Embryo Transfer. Transferred 2 Grade AA embryos. Prednisone 20mg for 3 days, bhusand and I both took Zithromax 5o0mg for 3 days. 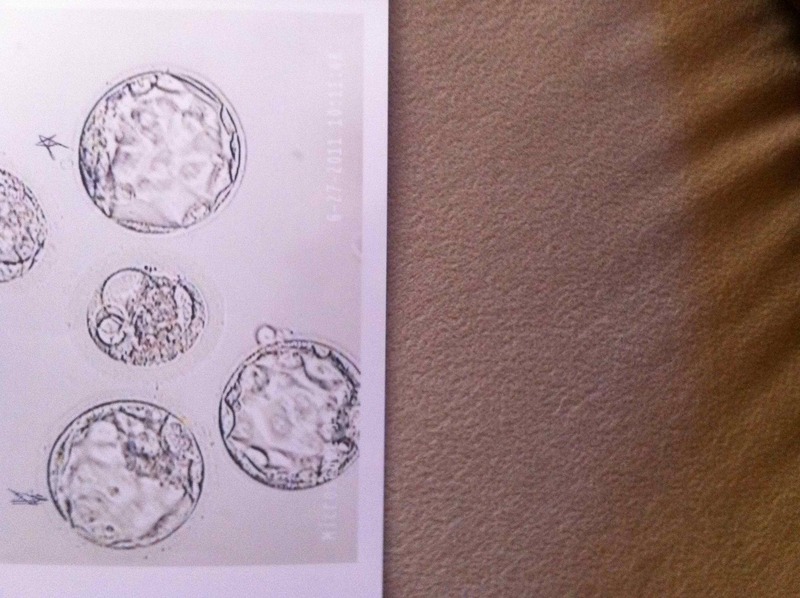 If you look to the left of the embryos, you can see a mark that indicated the two that were transferred. We called them Hanz and Franz. I didn’t use Lupron, which I was glad about, as most of the horror stories that I had read involved Lupron. But for the most part it was text-book. Everything went exactly as it was planned. Not a single problem. Which, in my cynical, half glass empty head, I saw as a foreboding sign. It CAN’T work out well if it goes perfectly right? I still don’t know what went wrong. I probably never will. I was told the usual, “most like a chromosomal abnormality”. I chose not to do the testing because I was told that there was such a good chance that it would be inconclusive because the fetal demise occured at only around 6weeks. Also, I couldn’t bear the thought of knowing if it would have been a boy a girl. That’s the real truth behind not doing the chromosomal testing. I just couldn’t bear to know what it would have been. I want to do an FET. I have 6 little embryos waiting for me. A few good, a few fair quality. I want to try again. But I am SO SCARED. I’m afraid to even call the doctors office to make the WTF appointment that I haven’t even had yet. But I’m getting there. I am definately getting there. Posted in Infertility, IVF, Miscarriage, Parenting and tagged 2WW, AA embryo, antagonist protocol, bravelle, chromosomal testing, egg retrieval, embryo transfer, endometrum, fear, FET, ganirelix, IVF, menopur, Ovidrel, prometrium, WTF appointment. Bookmark the permalink.